New Horizons Restarts Sending Pretty, Pretty Data Home Today! It’s coming, it’s coming! 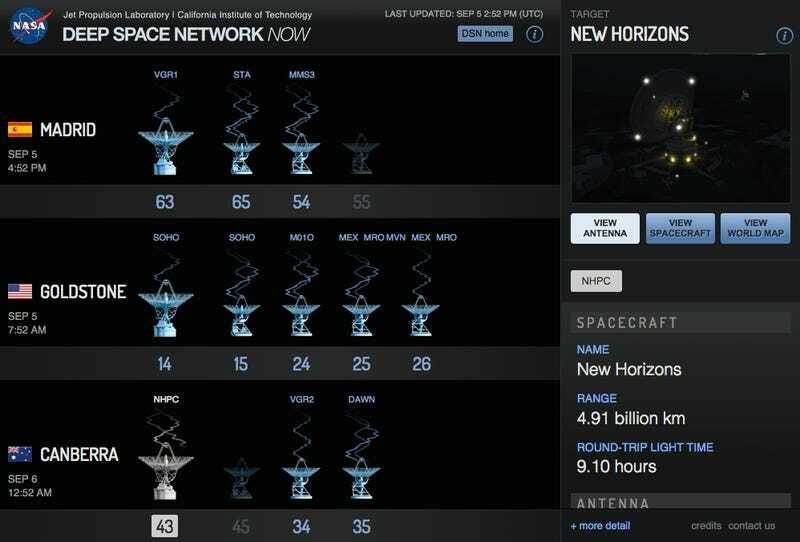 The New Horizons space probe starts its intensive data downlink phase today! You know what that means? New, never-seen photos of the dwarf planet are coming right at us! Squee!! New Horizons has tens of gigabits of data from the Pluto flyby which will be downlinked via the Deep Space Network of antennas. The spacecraft is so far away, it takes the radio signals carrying the data 4.5 hours to make the trip from probe to Earth. The spacecraft can only collect data or downlink it, so during the flyby it was busy measuring as much as it could about Pluto and its moons to tell us about later. In the month after the initial flurry, the team purposely scheduled the massive, slow-to-downlink datasets on energetic particles, solar wind, and space dust to give themselves a bit of a breather. But today marks a change when that 1 to 4 kilobits per second is switched over images, spectra, and other data. While it’s impossible to predict what secrets the dwarf planet has in store for us, we know the New Horizons science team will release their raw, unprocessed image sets each Friday until all the data is down in Fall 2016. Want to watch the data come down? Check out the real-time Deep Space now website!